I&apos;ve built a dozen ships and this was one of the more fun to build. I made a number of replacement pieces so as not to use the metal parts supplied. Instructions were good and easily followed. Planking was straight forward and final product is a gem. Detailed constuction methods allow modeler to form the hull by attaching planking strakes to the false keel and frames. Also, each mast must be built and painted or stained for added realism These features and more insure a truly realistic, detailed and rewarding building experience. All wood construction features Apple-wood, Ramin, Plywood, Mahogany Brass hardware such as eyebolts, stanchions, rings, hinges and hinge pins, belaying pins and much more. 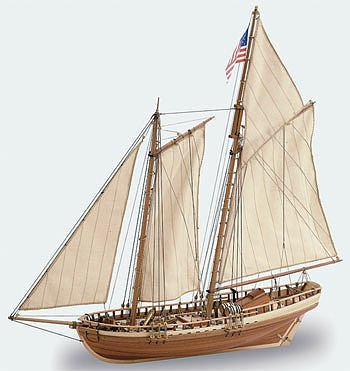 One Latina Viginia 1819 "Schooner", kit. All fittings, rigging, deck and hull planking strakes, plus main mast and bowsprit, instruction manual, assembly manual and 2-full size color sheets with photos of model in actual size, and other information. Wood putty, wood varnish, carpenter's glue, contact glue, CA glue, sandpaper and tools. General advice about varnishing, masts and sails and the running lines (rigging) are listed in Step-39 of the manual.